The new backlight system deployed in the EX750 delivers a genuine step forward in LCD light control. However, there are some colour and contrast inconsistencies in many of the picture settings, plus the sound is puny for such a massive TV set. Therefore it's a great rather than brilliant TV set. While Panasonic seems mostly focused on OLED technology these days, it still maintains a pretty extensive LCD range. After all, however much everyone might want to buy an OLED TV, they're still beyond the financial reach of many. The EX750 perfectly illustrates why there's plenty of life left in LCD yet. Despite the model on review being 65 inches in size and currently Panasonic's most high-end and cutting edge LCD TV, it costs just £1,499. You can't get even a 55-inch Panasonic OLED TV for anything like that little cash. It doesn't look heavy, though. Its subtle silver screen frame is delivered with on-trend trim. The set sits as if it's as light as a feather on the attractive chrome neck and cross-shaped base of its desktop stand. You can even (manually) turn the screen round on its pedestal to suit different seating positions. Smaller models in the EX750 range additionally let you raise or lower the position of the TV on the stand's neck, but presumably the 65-inch model is just too hefty to sustain such a mechanism. The EX750's rear hosts a strong set of connections. Four HDMIs lead the way, all of them capable of playing 4K and HDR (high dynamic range). Three USB ports, meanwhile, can either play video, music and photo files, or record from the built-in Freeview HD tuner to a USB-connected hard drive. The only other stuff that really matters these days are the TV's Ethernet and integrated Wi-Fi network options. Having a wired connection is preferable for fastest streaming speeds, but wireless is convenient if your network is up to task. While the current LCD TV generation has been relatively quiet when it comes to real backlight innovation, the EX750 is the exception to the rule. It introduces a new "digitally enhanced local dimming system" - which apparently adds per-pixel shuttering to a more traditional local dimming platform. To put this in more Layman's terms: the TV can adjust the angle of each pixel so that it can achieve better control over how much light from the TV's localised LED lighting passes through it. The idea behind this, of course, is to deliver improved contrast - especially improved black level response during dark scenes. It may also, though, enable the EX750 to dodge (or at least reduce) the backlight haloing and banding problems traditionally associated with LCD TVs. Especially when playing HDR content. Talking of HDR, the EX750 covers a decent selection of bases: namely the HDR10 industry standard, the HLG HDR format favoured by broadcasters, and - following an upcoming firmware update - the new HDR10+ format. The EX750 is the only LCD TVs with powerful enough processors to receive the HDR10+ update. Note that in keeping with the rest of Panasonic's 2017 and 2018 TV range, the EX750 range does not support the Dolby Vision HDR platform. The Studio Master HCX2 processing chip that makes the HDR10+ upgrade possible also delivers a number or other startling picture features for an LCD TV. For instance, there's a 3D Look Up Table approach to colour (of the sort that was once only seen in the world of high-end mastering monitors). There are also numerous picture processing features designed in conjunction with the experts at Panasonic's Hollywood Laboratory (and even members of the Hollywood creative community) to deliver pictures that track as closely as possible to the filmmakers' original vision. The edge-lit panel in the 65EX750 claims to be "Super Bright", capable of sustaining high brightness levels across its screen for markedly longer than typical LCD TVs. Finally, the 65EX750 is one of a mere handful of TVs you can buy right now that supports 3D playback. Yes, really. It uses the high resolution active shutter 3D approach, but doesn't ship with any 3D glasses as standard. In fact, Panasonic couldn't even provide a pair for this review! Panasonic's My Homescreen smart TV interface has slowly evolved into being one of the best in the business. Key to its success is its straightforward, clutter-free layout: the ease with which you can customise what apps appear where in the onscreen menus; the cartoonish attractiveness of its onscreen graphics; and its support of plenty of the video streaming apps most users pretty much exclusively want on a TV smart system. Netflix and Amazon are both available in their 4K and HDR incarnations, for instance, and there's YouTube too. The UK broadcasters' catch-up platforms, meanwhile, are provided within a Freeview Play "wrapper", meaning you can use a historical electronic programme guide interface (EPG; listings which scroll back in time as well as forwards) to track down shows you've missed. With the operating system also reacting slickly and accurately to your navigation instructions, the only serious complaint that can be levelled at it is that it doesn't support Now TV. The EX750 is a good picture performer so long as you're careful how you set it up. For HDR material, this essentially means running it in its Dynamic picture setting. This sounds pretty counter-intuitive given the bad reputation dynamic picture modes traditionally have. However, it's the only mode that largely avoids some significant colour problems visible with all the other picture presets. Using those other presets, even the usually most accurate True Cinema mode, colours look clearly less rich and vibrant in the screen's central areas than they do at its edges. This is a pretty unique problem, and so is likely down in some way to the new backlight system. The EX750's HDR pictures using any preset other than Dynamic also look generally rather flat and undynamic, as well as a little low on brightness. Switching to the Dynamic mode improves colour saturations to much more authentic looking levels, largely removes the colour inconsistencies between the edge and centre of the screen, and makes the image look generally far more punchy. In other words, the image as a whole looks much more HDR and immersive. What's more, this is achieved without leaving the image looking overblown or artificial as would normally be the case with a TV's Dynamic picture setting. Given that Panasonic sees its True Cinema preset as its most accurate one, the suspicion has to be that the Dynamic setting isn't going to give you quite the ultra-authentic picture experience Panasonic is so driven to provide. The colour issues in True Cinema mode, though, leave you with little choice but to take your picture settings elsewhere. So it's fortunate that the Dynamic preset delivers pictures which subjectively, at least, look really quite nice. More picture oddness comes from the EX750's Adaptive Dimming mode. Choosing the highest Adaptive Dimming level reduces brightness from a peak of around 522 nits to less than 400 nits, but delivers the richest black levels. Shifting to the Medium setting boosts the brightness, but introduces some distracting greyness in dark picture areas. Most film fans will likely prefer the Max Adaptive Dimming Setting, but the bottom line is that there's no Adaptive Dimming setting that delivers a perfect result. While the EX750 may not deliver the most punchy, dramatic HDR pictures when running in its all-round best-looking picture mode, it does earn major brownie points for its local backlight management. Even when a bright HDR object appears against a near black backdrop there's barely any sign of the usual light banding or blooming around it. This is the upside of the digitally enhanced local dimming technology. Appreciation for the EX750's backlight system steps up another gear, too, as it becomes clear that the finesse of its light controls allows the set to reproduce an impressive amount of subtle detailing and colour information in the darkest picture areas - especially when using the maximum Adaptive Dimming system. This additionally helps dark scenes enjoy as strong a sense of image depth as bright ones. Once you've greatly reduced the colour inconsistencies of the EX750's panel by selecting the Dynamic preset, its colour performance is strong. There's decent vibrancy to the wide colour gamuts available with HDR images, and lots of subtlety and detail in the rendering of fine blends. While the 65EX750's native 4K pictures aren't absolutely the sharpest in the TV world, they're comfortably clean and detailed enough. The Studio Master HCX processing also means that the set upscales HD sources to 4K exceptionally well. Plenty of extra detail is added at the same time that most source noise is effectively removed, leaving you with a picture that looks clearly beyond HD without appearing forced or digitally enhanced. The only issue with the EX750's sharpness is that it doesn't handle motion quite as well as some rivals. Use the IFC motion processing on its mid or high settings and judder and blur largely disappear, but only at the expense of quite distracting amounts of unwanted processing side effects. Turn the processing off or run it on its lowest setting, though, and motion can suffer with slightly uncomfortable amounts of judder. The EX750 adapts well to standard dynamic range sources. In fact, it's in its element with such material, where its slightly limited brightness doesn't have any negative impact at all. Black levels look immaculate, shadow and colour details look beautifully subtle and natural, and there are next to no backlight distractions to break your sense of immersion. Overall the EX750 has just enough brightness and contrast shortcomings to fall short of being a truly brilliant picture performer. Provided you follow the setup advice given here, though, it can at least be a great one. The 65EX50 is almost bizarrely weak in the sound department, though. Despite its heavy bodywork, for instance, it's unable to muster any sort of convincing bass. To make matters worse, its mid-range sounds stifled and cramped, and there's little to no projection of the sound beyond the confines of the TV's bodywork. In fact, dialogue tends to sound so thin and weedy that it doesn't even appear to be attached to the pictures. The best that can be said of the 65EX750's sound is that it's reasonably detailed in the treble register and the speakers don't distort or crackle even when pushed to the outer extremes of their limited abilities. Panasonic is to be congratulated for continuing to innovate in the LCD world despite its increasing focus on OLED technology. The new backlight system deployed in the EX750 delivers a genuine step forward in LCD light control that hopefully Panasonic will continue to refine with its next TV range. In other areas the 65EX750 isn't perfect, though. Some strange colour and contrast inconsistencies limits what picture settings you'll want to use, while a general lack of brightness limits the screen's impact with HDR sources. It also accompanies its 65-inch pictures with surprisingly puny sound. Provided you're prepared to accommodate its picture setup limitations and ideally partner it with a soundbar, though, the 65EX750 is still capable of being an impressive TV. 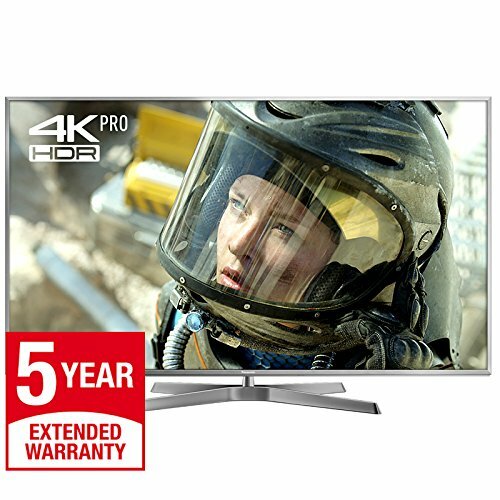 The Panasonic EX750 is available to buy now, priced £1,499 for the 65-inch model. If you can stretch your budget another £50, Sony's 65XE9005 is an attractive alternative to Panasonic's set. Its direct-lit LCD panel delivers startlingly deep, rich black levels, while Sony's X1 processing chip achieves some gorgeous colour and detail resolution. It's also brighter (handy for HDR), hitting peaks of around 900 nits. The only real problem with it is its clunky, buggy Android TV operating system. Despite costing slightly less than the EX750, this mid-to-high range Samsung set peaks at around 1000 nits, making it a more dramatic handler of high dynamic range sources. It delivers a wide colour response too, and boasts an elegant design and superior sound system. It doesn't, though, deliver the same sort of rich black colours and backlight consistency a carefully set up EX750 can manage.